The Chief Constable of West Midlands recently told his officers not to charge or give a warning to those caught with cannabis. In a remarkable step forward for science-backed policies, police forces across the UK were told to stop pursuing prosecutions for cannabis users. The softened approach to cannabis was announced over the weekend by the National Police Chiefs’ Council (NPCC), the body that develops nationwide operational policies. 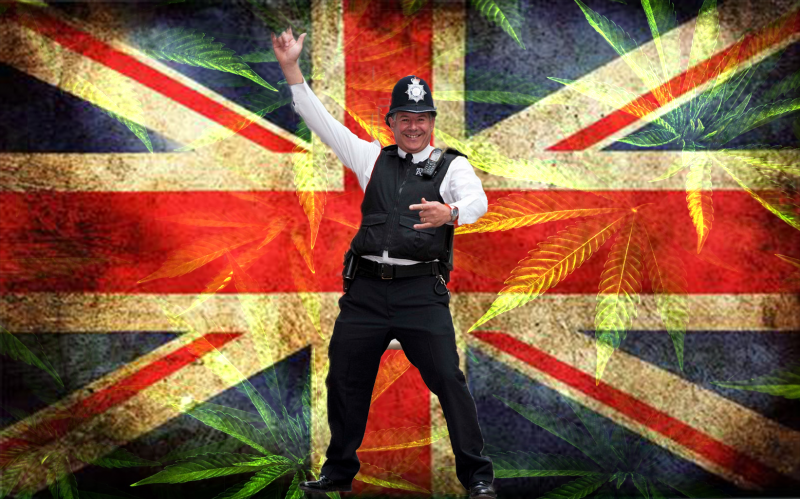 During the announcement, individual chief constables were told they now have the decision to tell their local forces to either actively pursue arrests for those using cannabis. Ultimately, however, the NPCC favours a softer approach to cannabis, based on scientific research which shows there is no good evidence to suggest that arresting drug users prevents use. Jason Harwin, Cleveland’s assistant chief constable, and the NPCC’s ‘lead for drugs’, explained to the press conference that offering cannabis users to go for treatment, rather than prosecuting them, is the best way to prevent re-offending, providing the “best outcome” for both users and the criminal justice system. “There is strong evidence to suggest that recommending minor offenders for early intervention treatment instead of pursuing convictions can prevent re-offending and result in the best outcome for both the user and the criminal justice system. “It is a matter for chief constables, in liaison with their police and crime commissioners, to determine operational priorities. The Home office responded to the NPCC statement, saying that police chiefs are expected to enforce the law. The decision to base policy of scientific research is almost unheard of in Britain, especially when it comes to policing cannabis. The NPCC’s decision to not actively pursue individual cannabis users will take a huge strain off an already stretched police force, which has suffered years of cuts due to Conservative Austerity policies. The decision, however, does not mean that police forces will stop pursuing large criminal gangs, far from it. It protects those who are most vulnerable. If British police can put less attention on arresting individual cannabis users, they focus their attention on criminal gangs profiting from a host of nefarious activities, such as using slaves to grow cannabis in the UK. There are, however, those who oppose research-based policies. While trying to condemn the softer approach to cannabis by police, Kathy Gyngell, the co-editor for the Conservative Woman website, accidentally offered support. “This is astonishing in view of the cumulative relationship between cannabis and violence,” Gyngell said. What Gyngell may not realise is that the violence tied to cannabis is directly linked to it being illegal. By banning cannabis, Governments hand all the power to criminal gangs, which wage war with each other to make the most profit, brining in children to sell their drugs for them. Research has shown that when US States legalised cannabis, at least for medicinal use, they saw a reduction in violent crime. Statements like those from Kathy Gyngell should not be laughed at or scorned by the cannabis movement, but embraced, as they, unintentionally, support our cause. Reasoned debate with those opposed to legalisation is the only way to progress; winning them over is more important than arguing into an echo chamber with people who already agree that cannabis should be legalised.